Our New Generation of emergency products are the smartest to date and the perfect choice when upgrading your existing emergency installation. Ektor perfectly integrated with zencontrol, provider of smart technology and control systems, self-proclaimed DALI experts. Visit zencontrol to learn more. Scaleable infrastructere for wired and wireless solutions, regular updates to keep up with industry developments. Identify and test faster, remove the need and cost of additional wiring. Automatic testing, easy commissioning and reporting. Control your Emergencies remotely. Ektor batteries use an optimal charge algorithm designed to maximise the charging efficiency. Wired or Wireless, Ektor is adaptable to your infrastructure, now and in the future. By connecting Ektor products up to the zencontrol system you no longer need to use slow, old and outdated software for control, reporting and commissioning of their buildings. Boasting a horizontally scaleable infrastructure zencontrol’s smart services continue to evolve giving greater value to customers and users well after initial installation. Easily change cabling systems to be compatible with your building’s infrastructure. This modular method allows fast replacement of the device without the need to special order products with your needed cable system. Migrate your emergency testing to Ektor, the only emergency range out there that is fully adapted to integrate with zencontrol’s wireless smart services. Our Wi-Fi enabled range of emergency lighting is the smartest choice when upgrading your existing emergency installation. The new generation Wi-Fi enabled emergency lighting from Ektor changes the way we think about emergency testing and monitoring. Built using standard wireless technology and protocols our devices can be connected directly to your android phone / tablet or connected directly to your existing Wi-Fi infrastructure. By using Wi-Fi, we remove the need for additional wiring and the cost associated with it. 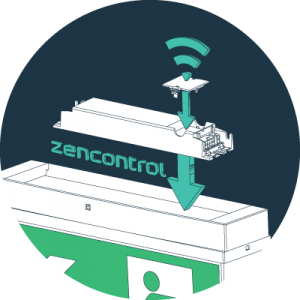 With zencontrol Wi-Fi expansion modules sites can be tested easily from an android app or from the Cloud. Simply clip in the zencontrol Wi-Fi daughterboard into the designated spot on the driver that comes with your emergency device to enable Wi-Fi connections. Download the zencontrol app from the android store. Create a new building(+) and add the location details. Manage multiple buildings and sites from the same application. Tap to add fitting(+) to your building in the zencontrol app, and press the test switch three times on your Ektor emergency products. Your device will be paired and added to the building. Add information such as location and address to the fitting. Start a duration test, function test or schedule a future test from your phone and sync to the device. 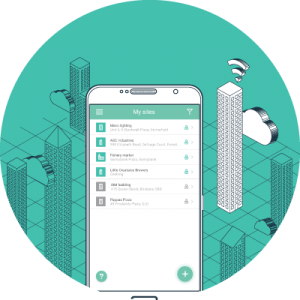 The app automatically performs any testing as required by building authorities.Your phone will connect to all devices in range. Walk around the site to automatically connect and sync to all fittings. Your emergency results are backed up and saved securely on the cloud. This ensures your site records are always available, should they be needed to prove compliance. Track the data easily and quickly with quality fitting information which includes the brand, name and serial number of the product. Identify problem products faster with easy to find replacement history. Automatically generated test results are published to the Cloud and are available immediately. and future proof your Emergency devices now! Ektor employs the zencontrol Cloud system in its emergencies to bring them to the next level. The interface allows building owners, installers and electricians to monitor and control all their buildings from one secure, encrypted, convenient and easy to use interface. The Cloud represents seamless bi-directional building lighting management with a full set of class leading features. Cloud control makes commissioning and setup fast and efficient, save days and in some cases months. With zencontrol plan building monitoring, fault reporting and testing is fast and efficient. Copy / paste existing setups to replicate setting across controlled items. Quickly identify problem setups & issues as the Cloud alerts the user. Shows the status of connected devices including activated lights and failures. Control lights individually and initiate EM testing directly from the interface. Full compliance with DALI standards ensures that our products function as expected to ensure a consistent experience through the systems life cycle. With DALI-2 lighting control has been simplified further. Now the switching and sensor devices which were normally locked to a proprietary control system, or contained within another protocol have been moved onto the DALI line. This increases freedom, availability and choice for the installers and customers as now they can choose from a large number of compatible products.